After a 2-week round-up we’re happy to announce a new update of Quote Roller. Here is a short overview of the most interesting features that have been included in this release. We added integration with SalesForce CRM, RightSignature, released full quote internationalization, added a few features to CapsuleCRM integration and more. It has been a long ride but I’m happy to say that the initial version of localization is up and running. This new addition will make all our international users happier. 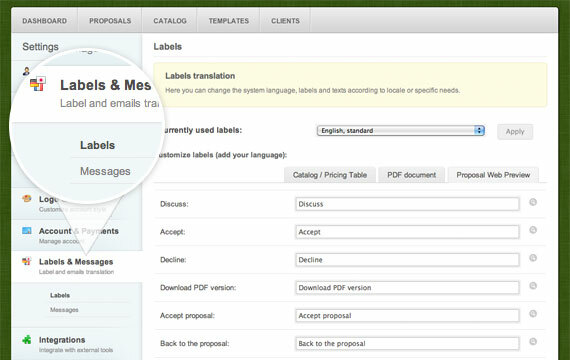 With the new Labels & Messages settings you can modify the all labels and texts visible on the Web and in the PDF versions of your proposal. Besides that you can completely customize all email messages. Capsule CRM integration. User-generated Link. Our users have always told us that Quote Roller is a great addition to Capsule CRM and they’ve always wanted to create beautiful quotes right from their favorite CRM system. Today we’ve taken a small step towards full-fledged integration and are currently introducing External link support. Our team sees Quote Roller as a Swiss Army Knife for working on proposals. That’s why we are trying to cover all aspects of this process. Some time ago we introduced our own electronic signature, we’d like to take it to a new level by offering RightSignature integration. Now your clients can sign proposals using RightSignature and all your legally signed documents will be saved in your account. Why do you need paper in 21st century? 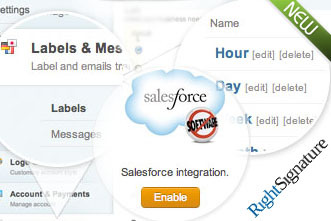 We have rolled out a basic integration with SalesForce. Currently a contacts sync option is available. The next step will be to integrate Quote Roller right into your Salesforce account. Stay tuned and if you have any ideas, let us know via our help desk system. Please note that you need to have Enterprise, Unlimited or Developer Edition of Salesforce and enabled API to use the integration. 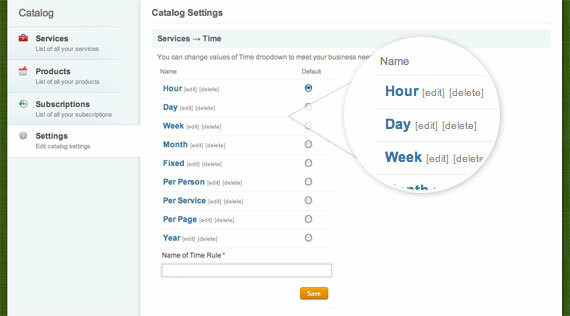 With the new catalog system you can customize all the different products and services you offer, ex. you can charge ‘per minute’ or ‘per mile’ or provide a subscription for ‘2.5 weeks’; you are no longer constrained by convention. There are also other improvements that are as important as new features. Now you can edit a proposal without having to send a new notification to your client, choose a default tax in settings, preview a template on the web and as PDF document and find many other small improvements. We appreciate all your help, questions, ideas and suggestions. It helps us to know where to focus our resources to improve the application, and all-in-all enjoy creating this awesome product! So thank you, and we look forward to hearing from you.